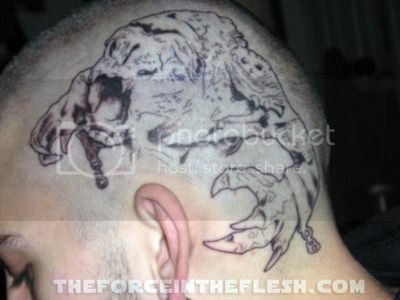 So was it bold for this guy to get a tattoo of the Rancor beast from Return of the Jedi on his skull? Sure. Right up until his hair grows in, when you’ll merely see a Rancor fingernail extending from his hairline. The joke is on him, though. And that joke is called “male pattern baldness”. Enjoy that complete lack of respect from everyone in society who matters, sir. And good luck with your future children’s crippling embarrassment. Via The Force in the Flesh, who thinks your body is a temple. A temple that needs lots of Star Wars-themed graffiti.